Graduating ECE and CS senior Ekaterina (Kate) Tolstaya is the recipient of an NSF Graduate Research Fellowship, based on her proposal in the broad area of Distributed RF Sensing. She plans to use this highly competitive award to pursue graduate study towards a Ph.D. degree in Electrical and Systems Engineering at the University of Pennsylvania, beginning fall 2016. At the University of Maryland, Kate has been a Banneker/Key Scholar, a fellow of the RISE program, the recipient of a Women in Engineering Fellowship, a laboratory teaching fellow in the Introduction to Engineering Design course, and an undergraduate teaching fellow for ENEE 101: Introduction to Electrical and Computer Engineering. Over a two-year period, she has also held a research internship in the MEMS Sensors and Actuators Laboratory (MSAL), studying supercapacitors and sensors to monitor biofilm growth. She has been a summer intern at Texas Instruments in Richardson, Texas, and at Microsoft in Redmond, Wash. More recently, she has been actively engaged in the study of Kinect-guided mobile robotics in the Intelligent Servosystems Laboratory of the Institute for Systems Research. 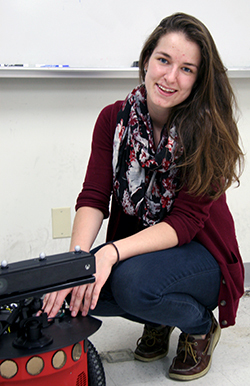 Kate's plans for graduate research include sensing and intelligent control in robotics.